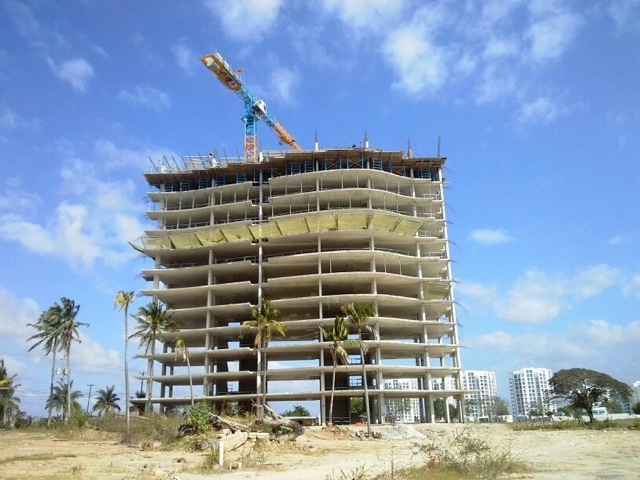 Questionable collateral: the Aqua Tower is being built on the sand of Playa Blanca, but it is alleged that the money was not spent on proper foundations and that the 13-story structure would thus be at risk of collapse and unable to get a proper occupancy permit. But the project is one of the assets on which bank loans and bond issues were based. When a company made a bond issue, obviously it wasn’t bankrupt. Notice which media are running the screaming headlines, who is making lame pronouncements and which interested parties are studiously ignored. In Cocle’s First Circuit Court, Judge Manuel de Jesús Corrales Hidalgo made a ruling in a voluntary bankruptcy case brought by the current owners of RG Hotels Inc, which was sold by its founder Rugiere Gálvez in 2014 and changed hands since. The judge held that RG Hotels was insolvent as of July 31, 2012 and that condition had been concealed by bogus records and false statements, and thus ordered a bankruptcy retroactive to that date. The company had made two bond issues worth some $30 million, and had been granted two loans adding up to $5 million by the state-owned Caja de Ahorros after that time. Now there is a great outcry — most notably in La Prensa, which has many business ties with the companies involved in Panama Oeste and Cocle beach developments — about the injustice and destructive effects of this rare back-dated bankruptcy. The complaint is that foreign investors will lose the money that they put into RG properties — Casa de Campo Farallon, Blue Vacation, the Ibiza Playa Coronado, the Ibiza Playa Corona, the Aqua Tower, the Las Perlas condo hotels (formerly Wyndham, before that Royalton, before that Nikki Beach) — and that this will send out an international shock wave that will harm all of the real estate developments along Panama’s Pacific beaches. For a long time the talk — never readily proven in large part due to Panama’s corporate secrecy laws — has been that much of that sector can’t withstand close financial scrutiny. But projects that are taking much longer than promised to pre-construction buyers to complete led to a recent Supreme Court decision voiding contract provisions that prevent buyers from canceling contracts when they don’t get their condos within the promised time, buildings allegedly completely sold that have few light on at night and allegations by foreign governments of money laundering in Panamanian real estate all suggest businesses that are not what they are represented to be. It’s not just a civil bankruptcy case, nor just a potential bursting of a real estate bubble anymore. Since this past June, prosecutors have been conducting a quiet criminal investigation of the Caja de Ahorros loans to RG. Will the scope of the probe go beyond those two transactions? There have been tales of questionable loans from that institution to politically connected people for at least 10 years, with names from the current and previous two administrations being raised — and vehemently disputed when raised in public. The bond issues, backed by some exceptionally specious collateral with the most prominent rabiblanco law firms and brokerage houses advising their clients to purchase that commercial paper, are already a shock to the already disreputable Panamanian securities industry. The Securities Market Superintendency says that it is drafting a rule to require those who would issue bonds on the Panamanian market to first get a debt rating by an outside company. There are complaints from stock brokerages and law firms that such a requirement would make it more costly and time-consuming to sell commercial paper. The point is also made that corrupted or clueless bond raters gave the worst Wall Street fraud artists stellar ratings ahead of the 2008 crash. But had some outside firm done some due diligence on RG, they would have found among the claimed assets the 2.9-hectare Farallon de Chiru land parcel, valued by RG at $400 per square meter. But this property has no access roads, is not subdivided into lots, and has neither streets nor sewers nor water lines nor storm drains nor electrical service. For banks and brokerages the stated value was $9,487,336 but in Judge Corrales’s court it was appraised at $347,675. Then there were properties included as collateral to which RG didn’t actually hold title, and buildings sold to condo investors with pools and clubhouses which were not, on paper, part of the same properties with the buildings in which the units were sold. There are other claims over which the old and new owners of RG are not particularly fighting with each other, but they are of a sort common up and down the beaches in “condo hotel” schemes. The way that is supposed to work is that condo owners live in their units when they want, but when they don’t they are managed as hotel units and the owners receive part of the revenue from their occupancy. RG systematically cheated the owners of this income and this practice is pretty much the norm here. For somebody who is laundering the proceeds of illegal activities abroad — maybe drugs, maybe playing Venezuela’s currency exchange black market, maybe a North American politician washing bribe money — it would not much matter. For some upper middle class snowbird who figures that a unit is like a time share arrangement, it might matter a great deal. To franchise chains like Nikki Beach, Wyndham and Royalton it also matters if systematic theft is happening under the rubric of their trademarks. Then, all up and down the beaches, there have been land grabs ongoing since at least the Moscoso administration. Is it all well settled and too late for any of those who were unable to afford lawyers and bribes when they were thrown out to claim any rights now? Perhaps. But do developers wanting to float bonds, and brokers who would like to sell them, want outside firms inquiring into the possible claims of the dispossessed and defrauded? And for that matter would the Bolsa de Valores and those who make their livings off of it care to have outsiders inquiring about how it is that the prices of stocks and bonds here seem to rarely have any relationship to the value of their underlying assets? Read the charges and counter-charges in La Prensa and La Estrella and you will see prominent names from Panameñista, Cambio Democratico and PRD governments come up. (You might also be able to figure out the sympathies of those who run those respective news organizations.) Look at old hype and you will see the beach condo promoters playing up their connections with the politicians of the day, via “advertorial” stuff misrepresented as news. The judge’s back-dated bankruptcy, if it stands up on appeal, surely would be bad news for bankers and bond holders. It would maket them unsecured creditors of a business empire with assets worth under $40 million but liabilities in excess of $150 million. But how much public sympathy will there be for people who put their money down in 2012 and 2013 because they figured that the Gálvezes and their partners were tight with Ricardo Martinelli, so it was a sure bet? For those who bought units at what is now Las Perlas because they want to live there, the equities are more compelling. They thought they owned their homes, and now they might not. The pool is dry, the grass isn’t cut, the electricity has been shut off and many have never received the deeds to the condos that they bought. What if the outcome of a bankruptcy court battle between two groups of investors is that these people, most of whom are foreigners, are tossed out onto the streets with no compensation? In that case it will be some years before anybody in Panama’s real estate sector will be able to pretend that it never happened. It will hurt, and people afraid of being hurt by others in different beach projects will start to ask uncomfortable questions about their situations. 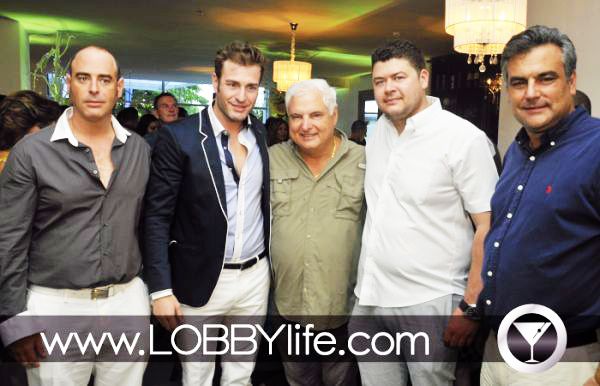 The guest of honor and dignitaries at the opening of the Ibiza Playa Corona. BUY NOW!!! It’s going up, Up, UP!!! Or so people were led to believe.